In a career spanning more than 25 years, pop-music parodist "Weird Al" Yankovic hasn't exactly ranked among the music business' fiercest iconoclasts: He doesn't release his song parodies without the consent of the artists being parodied, and he's rarely used the Internet as more than a tool to promote his projects and connect with his fans. But a music label's efforts to block a (relatively tame) parody of James Blunt's ubiquitous hit "You're Beautiful" has Yankovic fighting back publicly, and using his Web site as a tool to do so. So how, exactly, does a music label have a say in whether one of its artists can be parodied? 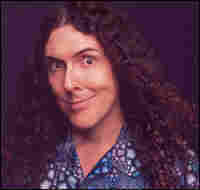 "The legality in this case is somewhat moot," Yankovic writes when contacted via e-mail. "James Blunt could still let me put it on my album if he really wanted to, but he obviously doesn't want to alienate his own record company... and my label could release the parody without Atlantic's blessing, but they don't really want to go to war with another label over this. So really, it's more of a political matter than a legal matter." Of course, it's not hard to circulate a song these days, and Yankovic has helped that process along by making an MP3 of the track available for free download on his Web site. It may not appear on Yankovic's new album, but "You're Pitiful" will still swirl around in cyberspace long after Blunt's original recedes from memory. "I have a long-standing history of respecting artists' wishes," Yankovic writes. "So if James Blunt himself were objecting, I wouldn't even offer my parody for free on my Web site. But since it's a bunch of suits -- who are actually going against their own artist's wishes -- I have absolutely no problem with it."